After twenty two years of existence as a state, Abia has witnessed a speedy pace of infrastructural development under the able leadership of Chief Theodore Orji (Ochendo). 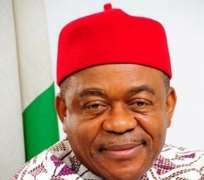 Within this period of existence, Theodore Orji's led administration is the only government that has been able to lay for the state a foundation for a modern state of this contemporary time. We the concerned youths of Abia state have thoroughly assessed the performance of His Excellency Chief T A Orji, and we are proud to enumerate the following as laudable projects executed by the Executive Governor of Abia state Chief T. A Orji. In turn provide employment opportunities for the teeming youths of the state. 2) Construction of a befitting workers secretariat at Umuahia with state of the arts facilities. 3) Construction of an ultra-modern office complex for Broadcasting Corporation of Abia State. (BCA). 4) Construction of a befitting Secretariat for Abia state Environmental Protection Agency (ASEPA). 5) Construction of Ultra-Modern Government House and Governors Lodge. 6) Construction of office complex For Abia State Planning Commission. 7) Construction of a high brow Housing Estate Amaokwe. 8) Construction of a specialist/diagnostic hospital in Aba and Umuahia. 9) Construction of over 250 Health Centres spread across the state. 10) Construction of women development Skills Acquisition Centre. 11) Construction of various Road networks in the state Reconstruction of Aba Port Harcourt Road a Federal Government Road, Amaekpe –Okagwe Road Ohafia , Abia state , Nkata –Alike Umukabia Road, Ohuhu , Umucha access Road to CKC , Ejiama Migha Abia state Ovim- Acha Road Amaogwu, Umuekwule Road Abiruba- Nkporo Road. 12) Reconstruction of Danfodio Road Aba, and Ukwumango spot on faulks Road Aba Abia state. 13) Construction of Ubani modern market with access Road and over 7,500 Shops. 14) A proposed Airport of International Standard for the state and projects too numerous to mention. Abia Concerned Youths Assembly has been waiting on the side-line for too long and now we have resolved to rise from the side-line to warn every baseless critic and paid agents whose ultimate aim is that of criticizing the government negatively, thereby distracting the attention of the government. It is glaring that the bulk of those negative critics are not resident in the state neither are they vested with how the state operates. Abia Concerned Youths Assembly considers it important to bring to the notice of all that the pace of development in Abia state, under the leadership of Chief T. A. Orji is unprecedented inspite of the state's lean resources accruable from the Federation Account and this simply concludes that the critics of this government are on the wrong part of assessment by comparing Abia with other oil producing states in the country. It gives us concern as concerned youths of an Assembly why the critics of T. A. Orji's administration are from a single stock, as if the state affairs is a one man orchestra. If the likes of General Ike Nwachukwu (RTD), Senator Adolphus Wabara, Senator Uche Chukwumerije, Onyema Ugochukwu, Chief Emeka Wogu and Senator Enyinnaya Abaribe etc. are supportive of T. A. Orji's administration. We wonder where these crops of baseless critics and detractors derive their strength from. Abia state long before now was known and rated as a den for kidnappers and armed robbers, but T. A. Orji's government has stamped out this social malady through his youth empowerment scheme. It is a thing of pride to note that it was in the reign of Chief T. A. Orji that Abia state was able to produce the chief of Army staff in the person of General Azubuike Iherjirika which has gone a long way in addressing the problem of insecurity in the state. We as concerned youths of Abia are blunt to express that if previous administrations had taken into cognizance the need for basic infrastructures, Chief T. A. Orji would have nothing to do than to continue form where they stopped rather the government is bearing the brunt of laying the foundation for a modern state of Abia. It is quite embarrassing to state that the previous governments in the state were running the affairs of the state in a rented government house until Chief T. A. Orji saw the need to construct a befitting Governors lodge/Government House for the state in which states like Jigawa state that was created the same time with Abia state had long been operating in owned Government house/lodge. Interestingly the history of Abia state cannot be complete if Chief Theodore Orji is not mentioned due to his efforts in fast-tracking developments in the state. Critics should learn to be objective in their criticism rather than depend on unfounded and baseless rumours. We as concerned youths of Abia state, under the aegis of Abia Concerned Youths Assembly have decided to support sustainable democracy and good governance under Chief T .A. Orji taking cognizance of the fact that Abia state has never had it so good. Chief T. A. Orji has touched every sector of the state in his developmental drive. We have no hesitation or reservation to applaud the good legacies of Chief T .A. Orji as the Governor of Abia state.